The sun is just cresting the rocky ridge line to the east as the Hill Crew arrives at the top of the Palmer lift at Timberline, ready for another day on the job. Hoisting an armful of bright-orange "SLOW" signs and a drill with an oversized bit, Alec Nelson sets off down the groomed slope, while Matt Heffernan stands near the exit of the lift terminal, stacking bags of salt and directing an increasing stream of speed-suited racers to their assigned lanes on the snowfield. 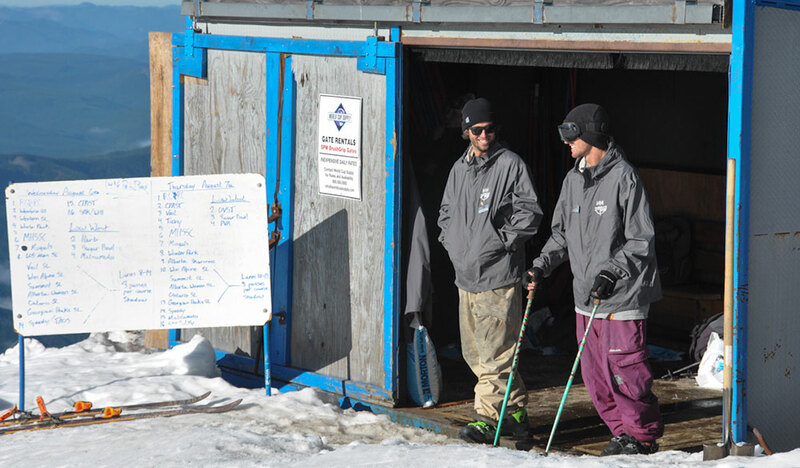 Nelson and Heffernan are on the Hill Crew, Timberline Ski Area's on-slope department that's responsible for keeping track of the comings and goings of all the race and freestyle camps that fill the slopes of the summer ski area every day. Part ski patrol, part concierge, part commodities dealers, the Hill Crew does its best to keep everyone happy. 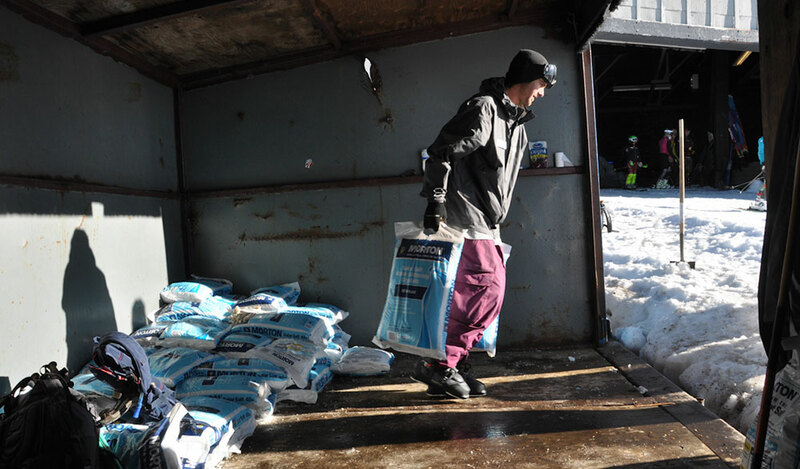 They allocate lane assignments to each team, assist ski patrol with signs and rope lines, and provide their clientele with supplies like race gates, safety equipment, and 40-pound bags of coarse Morton salt. Today no less than 26 different groups of skiers are operating simultaneously on the hill. The Alberta Women's Team, Keely's Camp for Girls, High Cascade Snowboard Camp, Mount Hood Ski Education Foundation, Ogden Valley Ski Team, Ontario Ski Team, Park City Ski Team, Vail Ski & Snowboard Club, Squaw Valley Ski Team, Stratton, Taos, Sugar Bowl Academy, and a camp that just calls itself "Party Beach"—they're all up here, jostling for room in a limited amount of space. Each group has its own needs, problems, and gripes—enough to keep the Hill Crew busy all morning. A coach from the Japanese camp, Matsumoto, is upset about an errant snow cat track through his lane. 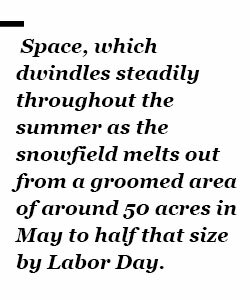 Other race coaches are having difficulty with "shadowing," that is, setting their gates to match those of their neighbors in order to conserve space—space which dwindles steadily throughout the summer as the snowfield melts out from a groomed area of around 50 acres in May to half that size by Labor Day. As the lanes get more crowded at mid-morning, Nelson handles a typical territorial dispute: a Canadian race coach is complaining that the Russian ski camp in the next lane is setting gates on the Canadians' turf. Meanwhile, Heffernan is doling out bags of salt to race coaches at the top of Palmer, keeping track of how many bags each team gets and making sure that they bring back the empties. "Can I get 15 bags?" asks a race coach from the Bridger Bowl team. "I'll start you off with ten, " replies Heff, "and if you need more, you can come back." 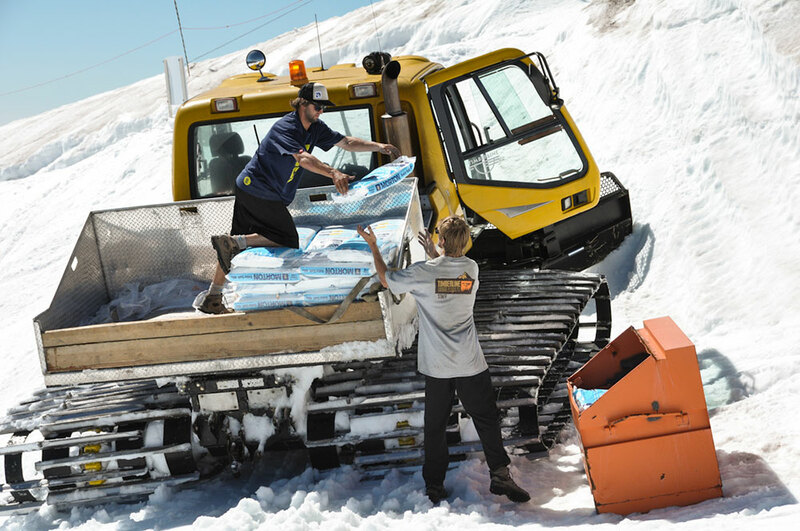 Salt (sodium chloride) is the secret ingredient in Timberline's summer skiing operation. Without it the treads of the resort's snowcats would spin uselessly in the summer slush and the famed summer snow parks would melt into shapeless mounds. The race camps require a firm snow surface on which their racers can keep an edge, and treat their lanes liberally with salt each morning, either by hand from the bags, or with backpack salt blowers—imagine a leaf blower with a 40-pound hopper—called "salt monkeys." On a hot summer day over 20,000 pounds of salt may be applied at Timberline in a 24-hour period. The total amount of salt spread on Palmer averages around a million pounds each summer. This quantity is not an uncontroversial topic. Local environmentalists and newspapers have contended that the ski area and its regulators aren't doing enough to monitor the long-term environmental effects both on-site and downstream in the Salmon River, a protected Wild and Scenic River and one of Oregon's prime salmon and steelhead habitats. "The DEQ can only regulate the salting when damage finally shows up downstream," complains one blog post featuring a downloadable "Stop Salting the Palmer Glacier" bumper sticker design. "In other words, when it's too late." The ski resort, which has been using salt on Palmer throughout its decades-long reign as one of the world's premier summer ski areas, responds that their monitoring system is comprehensive and effective. The resort says that chloride concentrations in the runoff beneath Palmer remain below state and federal water quality standards. “We are confident that we’re operating within the capabilities of the ecosystem," Timberline's PR Director Jon Tullis told POWDER in a phone conversation. "We’re the best in the world at what we do, including the salting program, and we’re proud of that." "Sometimes folks will take some potshots," he conceded. "But when they learn the facts, they learn the facts." While the controversy remains, business continues as usual on Palmer. In the salt game, the Hill Crew are the middlemen, providing each camp or team with the amount deemed necessary and keeping a tight watch on its usage, making sure that each group uses only what it needs, and that empty bags and extras are returned. Once their morning duties are completed, Nelson and Heffernan get to take advantage of the job's main perk—hot laps on Palmer until the lifts close for the day. Thanks to their top-of-Palmer connections, they've got unparalleled access to nearly every corner of the snowfield. It's no wonder that the Hill Crew tends to attract die-hard young skiers looking to spend their summers in ski boots, squeezing in laps on the private camp rope-tows between the morning and afternoon shift. Nelson and Heffernan are just two of a small crowd of Utah-wintering, Hood-summering students on the crew's roster this summer. 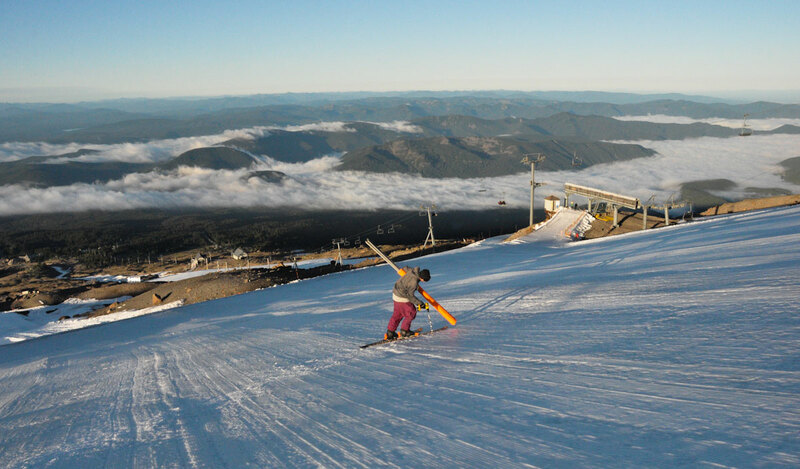 "It's definitely the best way to up your ski game in the summer," says Heffernan of his job. "Skiing every day, getting strong. It's awesome being up here every day instead of sitting behind a desk." "We're a tight-knit group," says Gretchen Emmons-Kelly, a 20-year veteran of the Hill Crew. "It takes a certain kind of person to last all summer up here." After the ski area closes for the day, the Hill Crew runs supply missions in a snow cat, transporting materials for the camps up and down the mountain and filling the salt bins for the next day. After watching the sun rise some 12 hours earlier, Nelson and Heffernan now watch it descend as they labor up the hill with two tons of salt in the back of the cat. They'll toss the bags into storage bins around the mountain before calling it a day and grabbing drinks down at Charlie's. Controversy aside, it's hard for a skier not to call this a dream job.